Whitney Jennings looks for a driving lane. Jennings played 54 minutes and scored 25 points in the loss. Jimmy Lafakis/Collegian file photo. 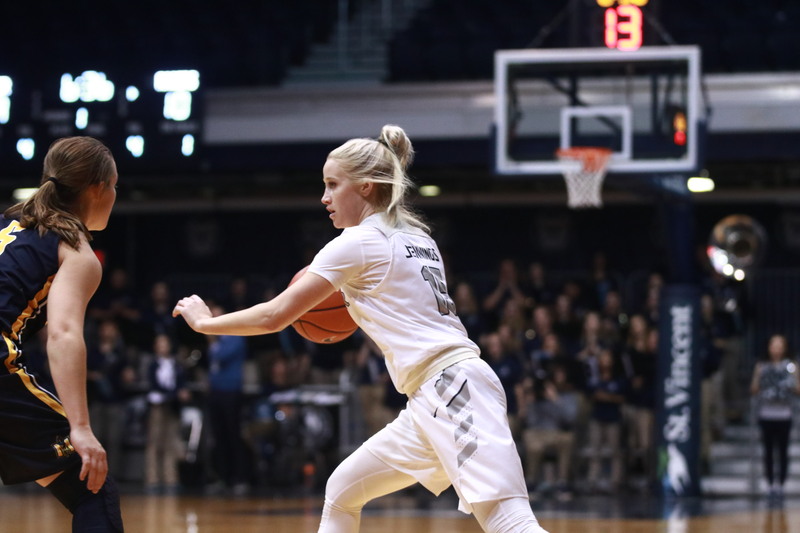 After three overtime periods, the Butler women’s basketball team fell to Providence on Jan. 18, 74-68. It was the Bulldogs’ first Big East loss of the season. They are now 5-1 in conference and 15-2 overall. The first statistic that stands out is the absurd number of minutes some players tallied: Whitney Jennings led the way with 54 minutes, Michelle Weaver played 46, Tori Schickel logged 44, and Shae Brey played 41. The high number of minutes inevitably led to foul trouble. In fact, Jennings was the only Butler starter to not foul out of the game. The Bulldogs started slow and were outscored 22-13 in the first quarter. They clawed back by halftime to take a 27-25 lead with a 14-3 advantage in the second. Providence won the final two quarters by one point each and the game was even until Providence scored nine points in the third overtime while holding Butler to only three. In those 54 minutes, Jennings notched a team-high 25 points. Despite those high totals, Tori Schickel was the one collecting the accolades for the Bulldogs. She grabbed her 1000th career rebound as a Bulldog. She snagged the board in the first quarter and wound up with 20 points and 12 rebounds on the day. No other players reached double-digits for Butler. The Bulldogs look to bounce back on Jan. 20 in Omaha against Creighton. The game is at 3 p.m.